With the rain sheeting down outside as I write this, it is hard even to think that there may be some bright days ahead, when a refreshing white or a barbecue-friendly red might need to be pressed into service, preferably outdoors under a blazing sun. A what? 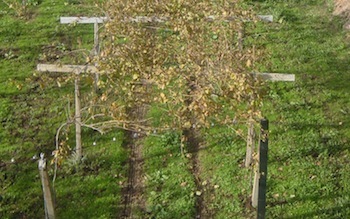 Pergola-trained vines in Galicia or ‘green Spain’. Three tasty numbers have crossed my bows recently, the first a Chablis, Domaine Pierre de Préhy 2008 12.5% €20.50 from Marks & Spencer. This is real Chablis from a great vintage. Lovely ripe fruit with a citric cut mingles with a delightful savoury ‘edge’, without which no Chablis is deserving of the name. Reading the small print on the back label I note that it comes from the highly respected hand of Jean-Marc Brocard. Class will out. It formed a superb aperitif match with smoked salmon pâté on crackers. In an entirely different idiom, the Terras Gauda O Rosal Rias Baixas 2011 12.5% €20+ (independents) provides a gorgeously suave and succulent mouthful. From Galicia or ‘green Spain’, the area just to the north of Portugal, this wine gives the lie to the stereotype of Spain as a producer of rich reds and little else. Ripe fruit takes centre stage but the supporting cast of mild minerality and whispering acid adds balance, complexity and depth. Drink it with just about any seafood you like.